A Renaissance Society exhibition offers a different way to take the measure of Cobb Hall. His juxtaposition of curves and lines and ways of measuring aesthetics and production came to mind while viewing Joëlle Tuerlinckx’s exhibition at the Renaissance Society this spring. 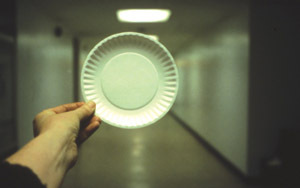 The first U.S. show by the Brussels-based artist took as its starting point the Society’s location in Cobb Hall. Reflecting the rhythm of changing class sessions, Chicago Studies: Les étants donnés was subtitled “Space Thesis in 8 sequences of 60 minutes with videos and demonstrations of material in natural and artificial light.” As Tuerlinckx puts it, “Space Thesis does not prove anything; instead it establishes, operates, connects data: data about things contained, coexisting in the same space….” Rolls of paper towels, pink “While You Were Out” notes, highlighted wall calendars—all became unexpected ways of marking off and seeing a space. The University of Chicago Magazine won several awards in the annual competition sponsored by the Council for the Advancement and Support of Education (CASE). Along with a silver medal for periodical-staff writing, we received the Grand Gold award for higher-education reporting, cited for a “willingness and ability to tackle solid higher-education issues and to bring a national perspective to the specific challenges” facing Chicago. And the winners are: freelance writer Patrick Clinton’s look at the U of C endowment, “Before the Bubble Finally Burst…” (April/02); associate editor Sharla Stewart’s analysis of the bear market for what used to be an M.B.A.’s No. 1 career option, “So Who Wants to be a Consultant?” (June/02); freelance writer Carrie Golus’s discussion of fraternity and sorority life, “Geeks Go Greek” (October/02); and associate editor Amy Braverman’s reports on changing rules for medical residents, “End of the Medical Marathon?” (October/02), and Chicago’s progress on the diversity front, “Minority Report” (February/03).